Back in October, the big story was not just that equity markets were selling off while bonds were rallying, but that inflation expectations had completely fallen off a cliff. And while the stock market found a bottom on October 15 and has since moved back to all-time highs, inflation expectations, after a brief bounce, are heading back towards their lows. Breakevens are indications of future inflation expectations, calculated by subtracting the yield on Treasury Inflation-Protected Securities notes from Treasury bonds of the same duration. This measure indicates what the market thinks the inflation rate will be over the next five- or ten-years, depending on the duration of the bond used. 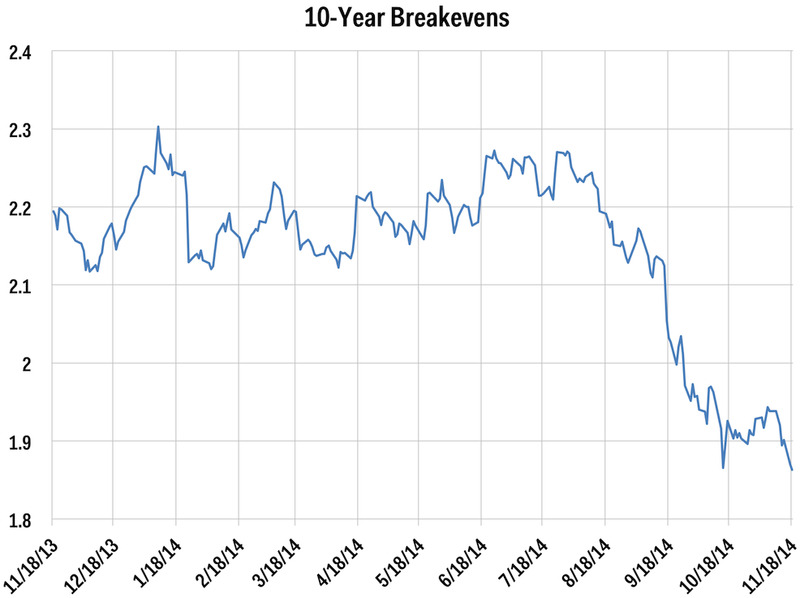 Headlines crossing Reuters early Tuesday noted that 10-year breakevens are now at 1.86%, their lowest level since October 15. 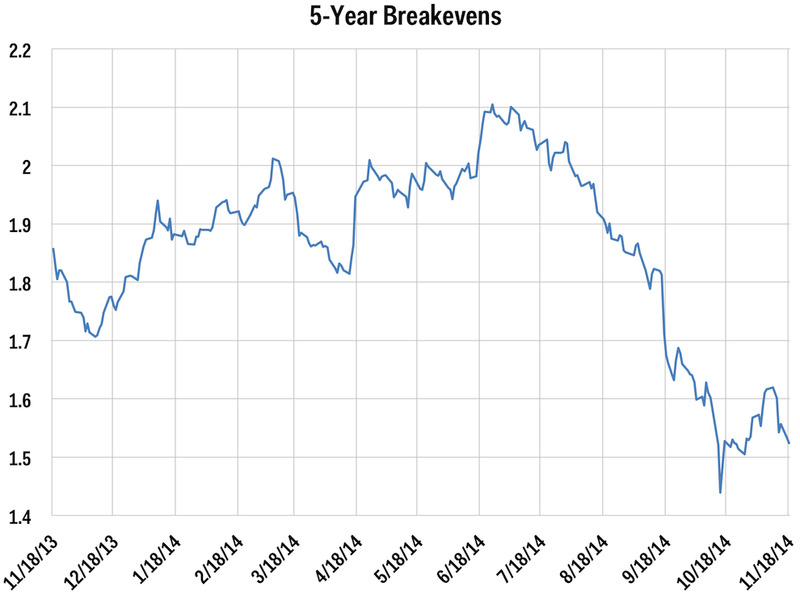 Meanwhile 5-year breakevens, which were the breakeven measure the market more closely followed through the fall, were down to 1.53%, their lowest level since October 29. 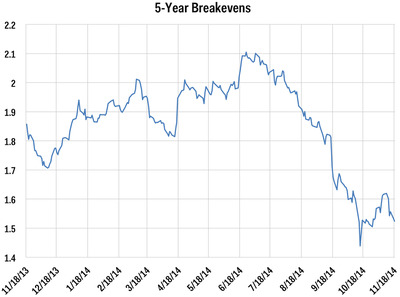 Back in mid-October, Bank of America’s Priya Misra highlighted this chart showing the decrease in inflation expectations via the decline in 5-year, 5-year forward inflation expectations. The chart Misra highlighted in October indicated that while the Fed was expected to end its QE program later that month, breakevens were showing the Fed was closer to more easing than turning off the spigot. On October 29, the Fed ended its QE program. Now, US stocks have a few things going for them. 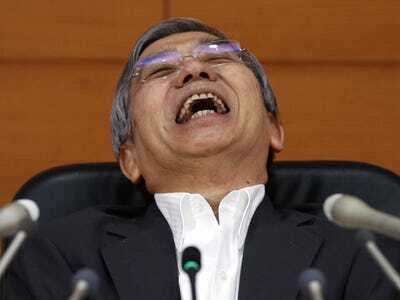 Less than two days after the Fed announced the end of its QE program, Japan unexpectedly increased its QE program. And the market still (largely) expects that the ECB will eventually undertake a larger QE program than what it is currently executing as the eurozone’s economy continues to flag. Additionally, yesterday we highlighted an observation from strategists at Citi Research, who said that in client meetings in Asia, they found disappointment from their clients who couldn’t believe they weren’t more bullish on US stock. And this was in spite of a forecast that sees the S&P 500 climbing to 2,200 by the end of next year, another ~10% gain. And all of this is on a background of oil prices that have basically crashed since the summer, with both Brent and WTI crude prices falling more than 30% since June to multi-year lows. So, there’s a lot going on out there, both in the US and abroad. But don’t forget about inflation.